WWE's biggest show of the year, Wrestlemania 35 came to the NY/NJ area and entertained legions of fans. From unexpected title victories, early main events, and questionable finishes. This is our rundown of the show and our thoughts of the various matches and some of the news surrounding Wrestlemania weekend. 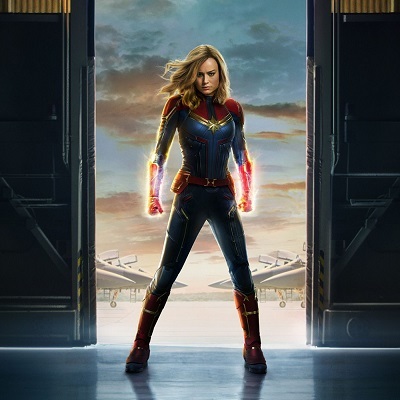 Rabblecast 564 - Captain Marvel and More! The film is set in 90's which lends itself to a conversation of nostalgia. From the Blockbuster Video store, 90's band posters on the wall(and the music used for the soundtrack), classic arcade games, and other call outs. We delve in deep and talk about what we enjoyed and how this fits in the MCU. Fair warning, there are SPOILERS ahead. The movie came out in early March(this episode was recorded 3/26/19) and it's been about a month since it's release. You have been warned. Laws... laws are put in place to help protect the rights of the members of a society and to ensure that they do not have to protect those rights through their own actions. But laws are human invention. We take a look at some ridiculous and outdated laws that still exist in New Jersey. For example, did you know that profanity is prohibited in Raritan, NJ? From there we transition over to E-Sports. Do you remember playing Street Fighter, Mortal Kombat, Tekken? E-Sports has come a long way from friends fighting for bragging right's in deep, dark basement. And, we also talk about the return of James Gunn to the MCU! (We realize this is older news, but this episode was originally recorded 3/19/2019.) This is great news considering how Gunn was released by parent company, Disney due to old tweets dating back almost 10 years. James Gunn now has two big projects on his plate. He will be returning to his duties on Guardians of the Galaxy Vol. 3. In the meantime, he's been contracted to write/direct a new Suicide Squad film for Warner Bros. and DC. Rabblecast 562 - Luke Perry, King Kong Bundy, Keith Flint, and More! Luke Perry(aged 52), was an American actor. He became a teen idol for playing Dylan McKay on the TV series Beverly Hills, 90210 from 1990 to 1995, and again from 1998 to 2000. He also starred as Fred Andrews on the CW series Riverdale, and had guest roles on notable shows such as Criminal Minds, Law & Order: Special Victims Unit, The Simpsons, and Will & Grace. Christopher Pallies(aged 63), was an American professional wrestler, better known by his ring name, King Kong Bundy. He is best known for his appearances in the World Wrestling Federation (WWF) in the mid-1980s and mid-1990s. He wrestled in the main event of WrestleMania 2 in 1986, facing Hulk Hogan in a steel cage match for the WWF World Heavyweight Championship. Keith Flint(aged 49), was an English vocalist, dancer and motorcycle racer. He was a founding member of the electronic dance act The Prodigy. Starting out as a dancer, he became the front man of the group and performed on the group's two UK number one singles, "Firestarter" and "Breathe" both released in 1996. ...all of this and much more on this episode!